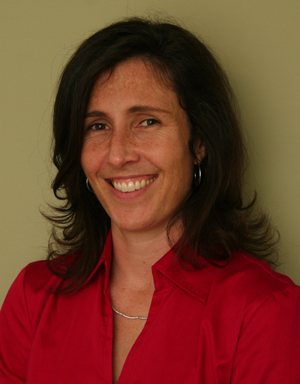 ← When It Comes to Career Prep: Are Campuses and Employers Speaking the Same Language? Do You Have an “A” Resume? Not Good Enough! Only problem is, the competition for all those good jobs is comprised of other people just like you in that one respect–they all have straight A’s, too! To get the interview, you need an A+ resume. But more than that, you need to highlight the unique you, the experiences and attributes that truly make you a standout candidate. This is a minor detail, but that is what separates all the run-of-the-mill ‘A’ resumes from the standout, ‘A+’ resumes. Let’s look at other changes in this same section of the resume. 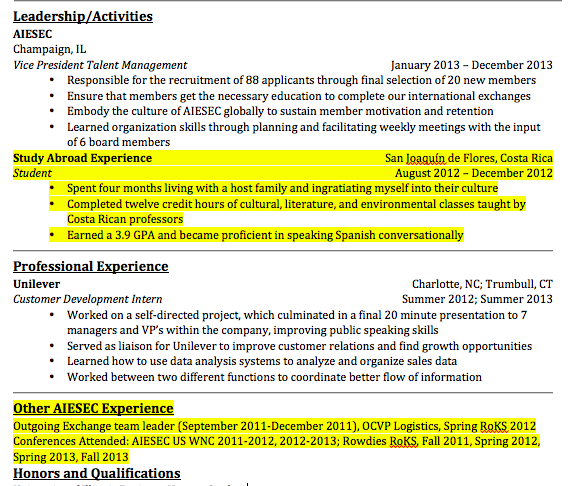 And I love the use of quantifiable information in this entry–and throughout this resume! Let’s move on to some more dramatic changes to the “Leadership” section of this resume. 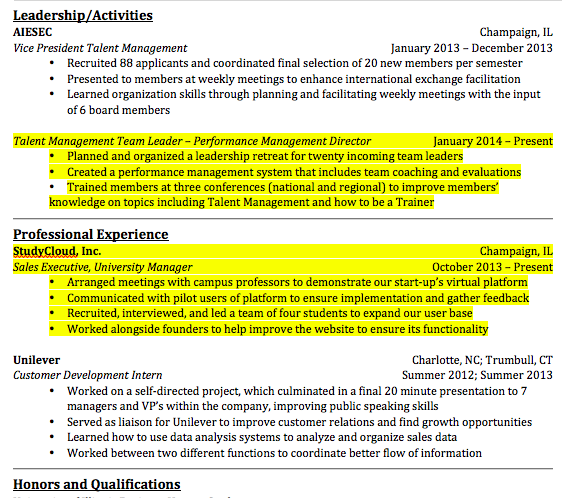 All the highlighted information pictured here gets deleted in the ‘after’ resume. First, the information about study abroad, which features the “student self,” is sacrificed to make room for more professional experience (the study abroad and language skills do make it in to the last two lines of the resume–in the “Honors and Qualifications” section). Second, the AIESEC information is a confusion of acronyms and dates. In the after, we see clear explanations of conferences, retreats, and team leader work with AIESEC–and it has been re-organized so that it appears with the other AIESEC content. We also see this candidate’s work with a start-up called Study Cloud, which was completely absent on the before resume. This is another example of burying the lead. Don’t bury the lead! 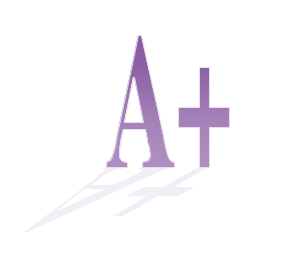 What changes do you need to make to your resume in order to stand out in a crowd of ‘A’ resumes? It might mean careful editing for details like consistent verb tense, typos, and insider abbreviations. It might mean re-organizing the content. Maybe you need to add something that you didn’t realize made you unique. Make sure your resume highlights those things that make you unique. And remember, you have to customize each copy you submit to the position you are applying to–so even after you have a polished resume like this “after” example, you will still have to move things around, add and subtract certain components, and include key words.